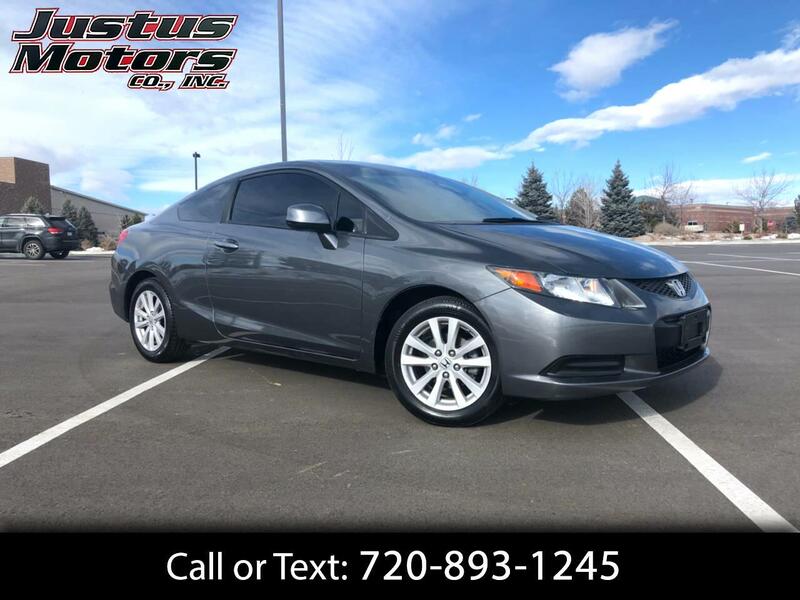 Used 2012 Honda Civic EX Coupe 5-Speed AT for Sale in Littleton CO 80120 Justus Motors Co. Inc.
Colorado Owned and Loved!! Call or Text Us Today 720-893-1245!! Amazing never looked so good! Our 2012 Honda Civic EX Sedan is shown in beautiful Cool Mist Metallic. Powered by a 1.8 Liter 4 cylinder that offers 140hp while connected to a smooth shifting 5 Speed Automatic transmission for easy passing tasks. Together this Front Wheel Drive team achieves near 39mpg while incredible aerodynamics with sculpted bumpers shows off a fresh look that will turn heads. The spacious EX interior features comfortable seating, a CD/MP3 Playback stereo, Bluetooth technology, and power accessories. You'll appreciate the sunroof and massive trunk for all of your gear as you confidently cruise around town. Honda is a leader in safety innovation and once again, the engineers behind this car have superior safety in mind with ACE body structure, an army of airbags and anti-lock brakes. Tried and true, this soulful car is built for fuel economy, safety, and entertaining driving dynamics. Once you get behind the wheel of our Civic you'll know you've made the right choice. Print this page and call us Now... We Know You Will Enjoy Your Test Drive Towards Ownership! Call or Text Us Today 720-893-1245!! Visit Justus Motors Co online at Justuscarsales.com to see more pictures of this vehicle or call us at 720-893-1245 today to schedule your test drive. All advertised prices exclude government fees and taxes, any finance charges and any emission testing charge. While we try to make sure that all prices posted here are accurate at all times, we cannot be responsible for typographical and other errors that may appear on the site. We make every effort to provide you the most accurate, up-to-the-minute information; however, it is your responsibility to verify with the Dealer that all details listed are accurate. The dealership is not responsible for typographical, pricing, product information, advertising or shipping errors. Advertised prices and available quantities are subject to change without notice. All rates and offers are dependent on bank approval, which varies based on applicant's credit as well as the vehicle.